Task: Manufacturer of door and window fittings, Sobinco, required a set of flexible automation solutions for prototyping and production at its plant in Zulte-Waregem, Belgium. Solution: To make prototypes and jigs for the several dozens of new models the company develops every year, Sobinco relies on FANUC wire EDM machines. Overnight and unsupervised, the ROBOCUT wire EDM produces the desired level of precision and surface finish required by the manufacturer. Production is completed using two FANUC ROBODRILL vertical-machining centres equipped with FANUC tending robots. Result: The sheer reliability of FANUC solutions was a major determining factor for Sobinco. Producing 500,000 pieces per year, the ROBODRILL unit can operate for six hours without human intervention. Thanks to their extreme flexibility, the machines, says the manufacturer, enable it to switch quickly between production runs. Did you ever stop to consider that hinges and other accessories for doors and windows are innovative products that are subject to a continuous process of refinement and enhancement? At Sobinco based in Zulte-Waregem, Belgium, FANUC machines, both electrical discharge (EDM) machines for prototyping and milling machines and robots in production, operate at full capacity. Modern hinges for doors and windows contain a lot of sophisticated technology ensuring that they maintain the required tension and proper adjustment of the components. Appearance is an equally important factor – for example, the recent trend to concealed window hinges, which are both aesthetically attractive and offer maintenance advantages. Each year, the R&D division of the Belgian window and door fittings manufacturer Sobinco develops tests and prepares several dozen new models for production. A hinge consists of two parts which move in relation to each other via a hinge pin in a pivot. The hinge pin is located on a metal plate that is fixed to the door, window or post. The production of hinges starts with an extruded metal section in the form of a plate and a hinge pin; the workpieces are then drilled out and milled. The first prototypes are cut from an aluminium block. For this purpose, Sobinco uses FANUC EDM machines which produce the desired precision and surface finish in a single action. Electrical erosion and electrical discharge machining in general is perhaps one of the least known technologies in the arsenal of the metal machinist, but Sobinco is one of many companies that is convinced of its potential and its advantages. Luc Cosyns is the head of Sobinco’s Tooling Dept. where the prototypes and jigs are created. The company operates six ROBOCUT machines, three of which are new models of the α-C400 iA type. Before taking charge of jig production, Luc worked for many years with EDM machines, a technology in which accordingly he is extremely well versed and from which he knows how to obtain the best results. He can for example create gears with oblique teeth on a ROBOCUT in a single operation, by placing the wire diagonally via the CNC controller. As a result, by refixing the workpiece to perform cuts on the other faces, it is possible to create complete prototypes with a EDM machine. The machines are also used to create jigs. Once the production has been formed, a die is created to extrude sections with the basic form. The subsequent machining, from extruded section to finished hinges is entirely automated. Dominique Losfeld, Head of the Machining Operations Zone: “The sections are held in the store from where a machine collect them one by one for sawing to length and drilling holes in them. The workpieces are then forwarded to a buffer where a FANUC robot picks them up to feed them to one of our two Robodrill milling machines. To do this, the robot must first position the workpieces 2 by 2 as they have to be loaded this way into the fixing system. 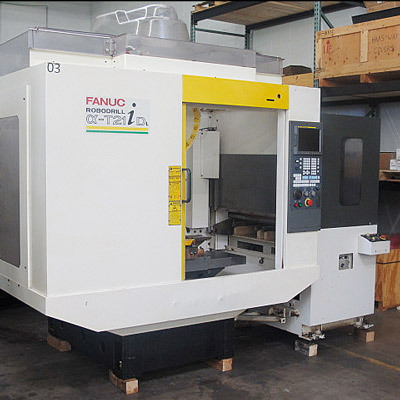 In this case, too, an important reason for opting for FANUC was the sheer reliability. Once the buffer is filled with sections, the unit can operate for six hours without human supervision, which is not a superfluous luxury since it has to produce 500,000 pieces a year. During our visit to the Zulte-Waregem factory, employing around 350 persons, the R&D division had just completed the development of a series of new products. The FANUC electroerosion and milling machines played a big role in the ambitious project to quickly bring these new products to market with Sobinco’s usual quality which has turned the family-owned company into a major player in this sector.